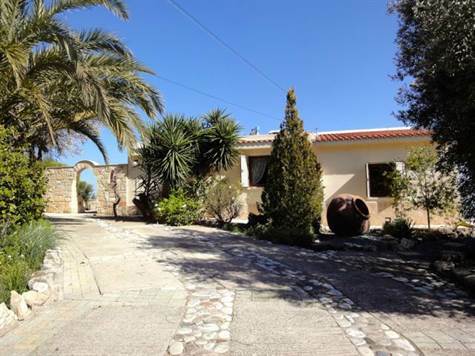 Kallepia, Paphos - This 3 bedroom bungalow is located in a beautiful rustic setting overlooking the local countryside of Kallepia, and the distant Troodos mountains. The property has been custom built for the current owners and is particularly spacious throughout. The main living accommodation is split level with a country style kitchen/dining room above and a large comfortable lounge below. A beautiful stone fireplace with wood burning stove is the focal point of the lounge and patio doors provide easy access to a large covered terrace with the most spectacular rural views. All three bedrooms are double size. Two have fitted wardrobes and en-suite facilities, and one is currently being used as a study and second sitting room. There is also a cloakroom accessed directly from the central hallway. Off the kitchen is an impressive private courtyard with barbecue facilities. A large outbuilding to the side is part utility room and part workshop. All around the substantial plot are quaint pathways meandering through the cottage style gardens which enjoy a wide variety of local plants, shrubs and an extensive fruit orchard. For those wanting to enjoy traditional village life in a quiet rural location and yet not be more than 15-20 minutes drive from the main amenities of Paphos, Kallepia is an ideal location. Another added bonus for golf lovers is the close proximity of the popular Minthis Hills Golf Club which is only 5 to 10 minutes away.